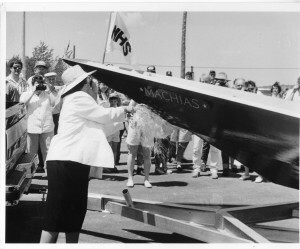 Deedee Schwartz, longtime Executive Director of the MHC, christens the bateau Machias in 1990. When the arts community persuaded the Johnson Administration in the 1960s to offer modest funding to the nation’s performing and visual artists, the scholarly community responded: why not offer federal support to the humanities as well? Government had generously funded science and technology: was cultural activity not just as important for the nation’s future? The result was the National Endowment for the Humanities, established in 1965 and still flourishing. Among other initiatives, the NEH channels federal funds to state humanities councils, to encourage locally based projects for all Americans. In 1971 Maine was one of the first states to experiment with these programs. Its Maine State Commission on the Arts and Humanities went through several name changes before finally settling in 1981 on the Maine Humanities Council. While many of the pilot programs had a strong public policy focus (to make them palatable in a political world still somewhat suspicious of “culture”), the MHC soon found its own identity as an intensely community oriented nonprofit. It sought ways to help Mainers understand their lives as thinking human beings and as beneficiaries of the state’s rich historic culture. Ezra and Lois Lamdin, longtime friends of and program participants with the MHC. It’s not just enough to read a good book (or watch a film, or listen to music, or…), as rewarding as that may be. An extra dimension is needed – the chance to talk about what you’ve experienced with friends and neighbors and colleagues. 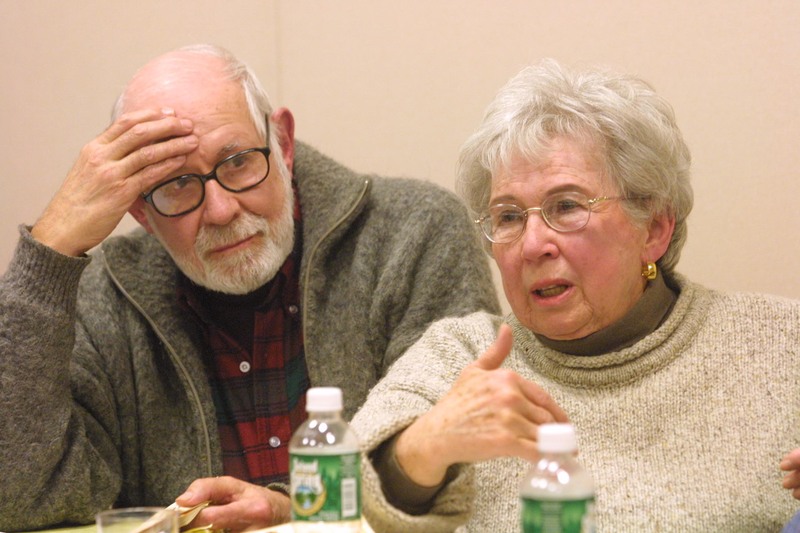 While book groups are an important community builder, they work best in the hands of a skilled facilitator – e.g., one of Maine’s many college and university teachers or independent scholars. Such programs must be available statewide, not just in the more heavily populated coastal regions. While it is important to fund major projects on “big” subjects, it’s just as vital for the MHC’s mission to provide small grants that can make all the difference to a local historical society, museum, or cultural organization. Given modest resources, the MHC should leverage its funds by forming long-term partnerships with Maine’s other cultural and social agencies. Squeezed into half of a 19th-century Cape on Cumberland Avenue, the MHC office resembled a combination of a good used bookstore and a grad school dorm. You could visit the bathroom and use the Xerox machine at the same time. An unused bathtub housed the archives. Staffers pulling all-nighters – Deedee loved the adrenalin surge of deadlines! — could nap on the “fainting couch” in her office. Yet out of these cramped quarters came an array of stunning projects and public initiatives that made Maine in the 1980s and 90s a more interesting place in which to live. In the long term, Deedee’s most far-sighted decision was to persuade the MHC’s friends and supporters that the organization had to become more entrepreneurial, especially when it became clear in 1994-95 that federal funding could not be taken for granted. Under her leadership the MHC launched a successful capital campaign that resulted in the Harriet P. Henry Center for the Book and more up-to-date quarters at 674 Brighton Avenue, in a part of Portland with quick access to the Maine Turnpike. In 2007, Deedee was succeeded as executive director by Erik Jorgensen, the former head of the Pejepscot Historical Society in Brunswick. He left in 2012 and has since become a representative in the Maine Legislature. Hayden Anderson now serves as executive director, with an able and dedicated group of colleagues bringing the MHC’s vision to life.